"Unfortunately, I have not any kind of relations with FIDE. That's because in reality this organisation doesn't exist. Their actions are supported neither by the Idea, nor by any plan. They meet, discuss something and make some decisions, which have no influence on the chess world. FIDE is remembered only when it prepares another mean trick for the chess players. We are told 600 million people are playing chess worldwide. Kirsan Nikolaevich is working on increasing the number to 1 billion... In the meanwhile in reality the audience of chess as a game is unknown, however, we can make rough calculations. 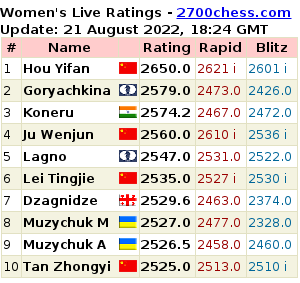 350 000 people are registered in FIDE rating list. 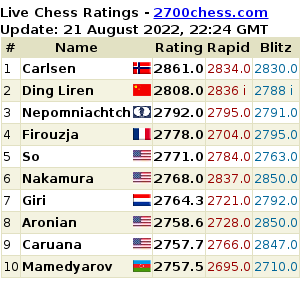 Those are people who have played at least in one tournament counted by FIDE. It's clear that there are people who participate in the competitions, but they aren't registered in the rating list, because they play chess just time after time. I guess the ratio between the first and second kinds of players is 1 to 5. OK, let’s say it is 1 to 10 just out of respect for Kirsan Nikolaevich. Let's say there are ten unregistered players on every registered player in the rating list. So, we will get that chess is played by more than 3 million people. This is the real audience, not the fabricated one. This is the audience we should love and work with. We should create the product for it, thus having a chance of increasing it, attracting new people to chess. No one does that though. You should communicate with the sponsors, offer them new ideas. We, for instance, continue holding the series of tournaments in the renowned museums of the world. The Alekhine Memorial will be opened in Louvre on April 20th. The second half of this tournament will be held in the Russian museum located in St. - Petersburg. This is a new idea and a new approach which is carried out by us together with businessmen Andrey Filatov and Gennady Timchenko. This is a continuation of the project which started by the World Championship Match held in Tretyakov Gallery in May last year. Predictebility! This is what the governance needs! Continues non-fulfilment of one's own obligations, changing the calendar... It's very hard when you don't know what to expect. When you don't know what to expect you prepare yourself to something negative. Building of a good reputation needs more than one year. FIDE, however, has lost it hopelessly. And there's no way out seen. Actually the chess player doesn't need much. Just simple things: a clear calendar, worthy payment for his work and respect to his profession! [...] Kirsan Nikolaevich has sponsored a lot of competitions. But why? His position suggests development and popularisation of chess, not holding the tournaments in Elista. Ilyumzhinov, to his credit, visits hundred countries in a year. He is well known in Azerbaijan, UAE, Mongolia, Iraq, Sri Lanka, Libya, Vietname and other distant territories of the world. He is a successful businessman. As we have got to know from mass media recently, he is mediator in transactions worth of millions. But what does that give to chess - the promises to build another Chess academy here or there? Well, build at least one and only afterwards start talking about others." Evgeny Sveshnikov Reacted on Levitov's Interview: "Ilya Open Your Eyes and Turn on Your Mind"
Evgeny Sveshnikov reacted on Ilya Levitov's recent interview which you can find here. Ilya Levitov: "We Plan Holding the Tournaments In Honor of the Soviet and Russian World Champions"
The press conference dedicated to the opening of the Alekhine Memorial was held in Paris. Ilya Levitov, the Chairman of the Management Board of the Russian Chess Federation, was among the speakers, "We have an idea of holding the tournaments in honor of the Soviet and Russian world champions within a year. We just need a stable funding," he said. E.SUROV: Chess-News is on air, Ernesto Inarkiev is with us. Good evening Ernesto! E.SUROV: Congratulations on your victory in the Moscow Open! Alexander Grischuk Thinks Every Participant of the Candidates Has a Chance of Winning It. "Am I Any Worse Than Anyone Else?" Here we offer you the extracts from Alexander Grischuk's interview given to Chesspro. I was asked to express an opinion about Magnus Carlsen's proposal to change the system for the world championship. Armenian team head coach Arshak Petrosyan in his interview given to Whychess site explained "why Armenia is ahead of the others every time?"